Despite the fact I have no children of my own and am not (for once) in the middle of any degree program, I'm still super excited for back-to-school! I love the slow onset of fall, seeing excited kids decked out in new backpacks stuffed with school supplies, and watching (through the wonder of social media) all the littles I've known over the years grow up and head off to university. I've mentored a lot of college students during my career and I've seen each and every one of them (and their parents) struggle with the first big, life-altering choice for most of these young people - and that is - "What should my major be?" Listen closely, young friends, for I'm about to tell you a very important secret . . . Your undergraduate major does. not. matter. But getting the degree does. Use your freshman year to get your university's core requirements out of the way. Take the English class and Statistics and Chemistry for non-majors. Not only will this keep you from stressing out and having to take an 8am seminar your senior year, but it exposes you to a variety of different disciplines, departments, and professors. This will help you make an educated decision about your major at the end of the year. Start thinking about whether you want your Bachelor's degree in Science or the Arts. Your mom may want you to be a dentist someday, but if the idea of taking science courses makes you panic, it's time to consider a different path. Really review what the course work looks like before choosing a broad major like Communications. These programs often teach important critical thinking skills, but can vary wildly from school to school. If you want to be a traditional print journalist, don't join a program that focuses on broadcast media. Be wary of the "Choose Your Own Adventure" majors. Many schools are offering programs where students can construct their own major. While it might seem cool to devote all your time to "Comic Books of the 1940s" with a minor in "Midcentury Sandcastle Building," this is just going to confuse future employers and advanced degree programs. Major in English with a minor in Architecture and write your papers on the topics that interest you. Your time as an undergraduate is not when you should focus on the niche. You might get half way through your chosen course of study and decide that you hate it. Passionately. That's ok! It's not a big deal and you have two choices. If you are lucky enough financially to extend your time at university, march straight down to the registrar, change your major, and sign on for some summer classes and maybe an extra year. If you're not, finish the degree and then make a new plan for your career. Most entry level positions and internships are just looking for students with a college degree. Will it be slightly harder for you to get a job in marketing if your degree is in physics? Probably. Will it be impossible? Not at all. Your major does not determine your career, but the skills you learn as an undergraduate will take you far in any career path. Be mindful, do your research, and be careful when following your heart or listening to well-intentioned loved ones. Are you working in the same field you majored in? 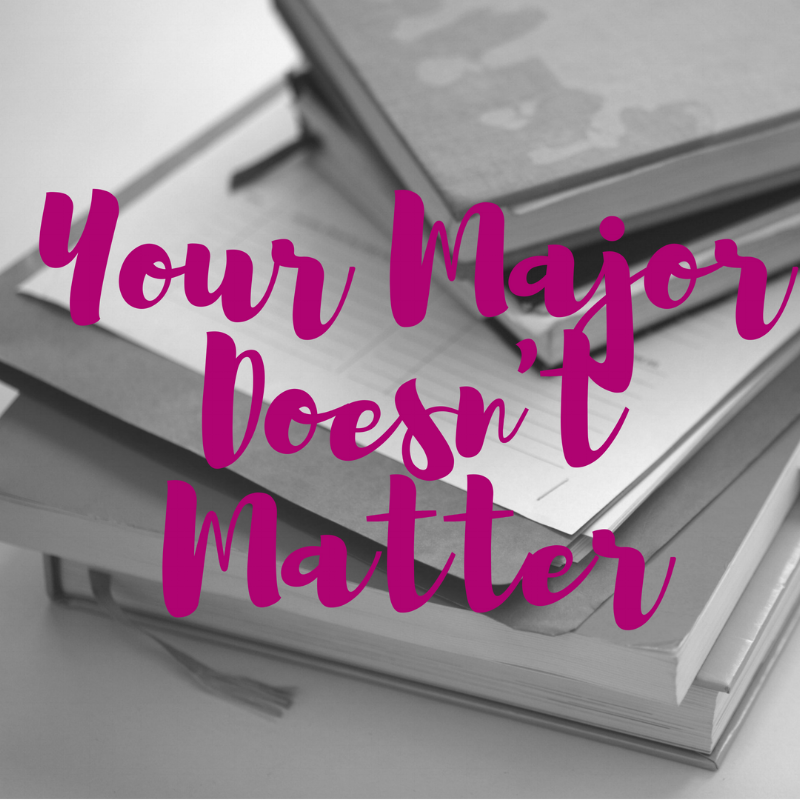 Are you stressed about choosing or finishing a major? Does your kid want to major in something weird? Come talk to me about it over on Instagram.